A gang who stole nearly £1million worth of cars and property from homes across East Anglia have been jailed. They were involved in 102 burglaries in Essex, Kent, Cambridgeshire, Suffolk, Hertfordshire, Norfolk, Enfield and Buckinghamshire between March 18 and September 29, 2014. The property stolen amounted to £970,000 of which around £159,000 worth was recovered. 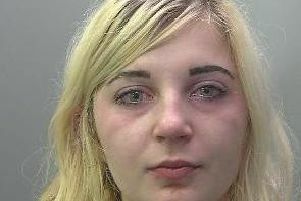 In one case, jewellery worth a five figure sum was stolen in April 2014, in another two cars, cash and jewellery worth a five figure sum total were stolen from an address and six burglaries were committed in one day in Cambridgeshire in March 2014. Couple Luke Wall, 24, and mum-of-three Teresa Connors, 21, both of Leicester Road, Tilbury, pictured themselves staying in a luxury penthouse suite at a hotel in London’s Docklands, showing off their ill-gotten gains. The pair breached bail conditions in relation to burglary offences and went on the run last June. After concerted police efforts, they were arrested in September last year but had continued to commit burglaries in the time they were on the run. Wall, Connors, Kyle Shillingford, 27, of no fixed address, and Joseph Mahon, 20, of Fanshawe Road, Cambridge, all admitted conspiracy to commit burglary. Robert Butler, 31, of Lilliput Road, Romford, denied conspiracy to commit burglary but was convicted after a trial. They were sentenced at Ipswich Crown Court today, Thursday June 18. Wall, who judge John Devaux described as being the leader of the group, was jailed for eight years. Butler was jailed for seven years, Mahon for 40 months and Connors for eight months. Shillingford was jailed for 28 months. Insp Paul Maleary, who at the time of the offences being committed was the senior investigating officer in the case, said: “The investigation team brought about conspiracy evidence for more than 100 burglaries committed by different members of this group. I suspect that they probably committed many more. “Wall in particular showed a blatant disregard for their victims’ feelings as often sentimental items of jewellery were stolen that have not been recovered.